IP finance: Are there too many patents? Innovation is the lifeblood of various technology markets including pharmaceuticals, software, telecommunications, consumer and automotive electronics. It is facilitated by R&D investments and secured from misappropriation by patenting. Meddling with patent law to discriminate among different types of inventions, industries or business models is unwarranted and would be harmful. It is generally agreed that patents encourage innovation in “static” or “non-sequential” developments where a patent corresponds to a single product, and upfront costs are high, such as in drug development. However, the enormous success of standards-based technologies such as those implemented in video codecs (e.g., H.264) and in mobile communications (e.g., GSM, UMTS and LTE)—each including hundreds or thousands of standards-essential patents (SEPs)—show that the patent system also works well when innovation is both “sequential” (each successive innovation builds on its predecessors) and “complementary” (various different innovations are combined). With the rise in patent litigation among some well-known smartphone technology companies, various theories of harm are being promoted seeking to radically undermine the patent system. Most recently, following US Judge Richard Posner’s June 2012 Opinion and Order including his decision to dismiss a case in which Apple and Motorola had sued each other for alleged smartphone patent infringement, the judge published an article in the Atlantic entitled “Why there are too many patents in America”. He is persuaded that the pharmaceutical industry “really does need” patent protection, but he would have patent law discriminate among different types of inventions or particular industries. However, his theory of differences fails when tested with examples in software and telecommunications. 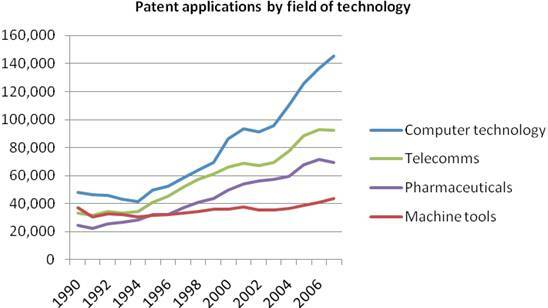 Similarly, a report commissioned by the UK Prime Minister and written by Professor Ian Hargreaves entitled Digital Opportunity: A Review of Intellectual Property and Growth, May 2011, states that patent “thickets” with “strategic” patenting in software and telecoms is a problem, as illustrated in Figure 1. His report cites academic research erroneously asserting that, in contrast to industries with non-sequential developments which underlie the traditional justification for patents, in industries with many sequential and complementary technologies—the software industry is given as an example—consumers and even technology innovators could be better off if there were no patents. The context of Judge Posner’s article is a comparison of pharmaceuticals versus software and communications technologies. Patented software in mobile phone user interfaces, operating systems and for communications functions have figured prominently along with industrial design rights in recent litigation among smartphone technology companies. Judge Posner incorrectly asserts, or overstates, three reasons why pharmaceuticals is different to other industries, in justification for weaker or no patent protection elsewhere: high R&D costs; long delays after patenting before revenues are generated; and low production costs. Whereas pharmaceuticals companies typically have R&D spending levels, as a percentage of sales, five times higher than an average of only 3.3% among 1,400 leading companies according to The 2011 EU Industrial R&D Investment Scoreboard, the corresponding percentages for software product companies are very similar to pharmaceutical companies, as shown in Figure 2. Microsoft’s total R&D expenditure ($9.8 billion over the last year) exceeds that of any pharmaceutical company. Increases in R&D investment since the 2009 downturn have been most significant in both pharmaceuticals and ICT and have fuelled economic growth. The top 50 Scoreboard companies invested €194 billion ($243 billion) in 2010, accounting for 42.5 % of the total R&D investment by the companies. Thirty-eight companies in the top 50 showed positive R&D investment growth over the preceding year including: Merck US (47 %), Abbot (35.7 %), Pfizer (21.4 %), LG (39.5 %), Oracle (38.9 %), Google (32.3 %), and Samsung (24.9 %). Whereas half of a 20-year patent term can elapse before a drug is clinically tested and approved for sale, there can also be similar length delays before patented ICT technologies are fully commercialised for adoption globally. For example, it took many years before new cellular technologies were adopted around the world with generational advances from 1G analogue to 2G (with mostly TDMA-based technology systems), then to 3G CDMA-based systems and most recently to 4G OFDMA-based systems. These new technologies have been brought to market commercially in nine year intervals, with peak sales reached after around 16 years, as indicated in Figure 3. Patented pharmaceuticals tend to reach peak sales sooner. However, European legislature has allowed extensions for pharmaceutical patentees through Supplementary Protection Certificates. Pioneering cellular technology innovation was undertaken around one generation ahead of widespread implementation. 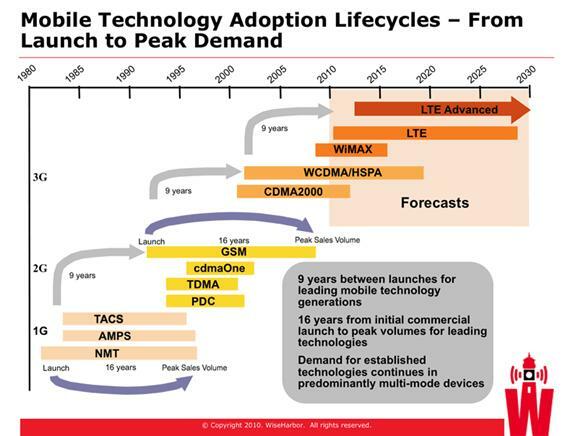 CDMA technologies were developed for cellular by Qualcomm, Motorola and others by the early 1990s, but it was 1999 before these were adopted by ETSI and 3GPP in the UMTS 3G standard with WCDMA. These organisations have defined the cellular technologies for 80% of mobile users worldwide since the mid 1990s. UMTS was gradually introduced by mobile operators over several years. Japan’s NTT DoCoMo was a solitary frontrunner with UMTS from 2001. UMTS was not commercially deployed until 2003 in Europe, until 2005 in the US by AT&T and until 2008 by T-Mobile USA. Prior to the UMTS standard, CDMA technologies in the cdmaOne standard were generally excluded by regulation except in the Americas, Korea and Japan. The oldest CDMA patents expired from around 2010. Similarly, OFDMA-based technologies for cellular communications were implemented by Flarion in Flash-OFDM and by many others in WiMAX from the mid 2000s, but market demand was niche and commercial performance for suppliers was poor until OFDMA cellular technologies were standardised for LTE by 3GPP with its Release 8 in 2008. The first LTE network was launched at the end of 2009. Widespread availability and adoption follows as network technologies are rolled out over several years. This is subject to national spectrum licensing and construction cycles that are capital intensive and time consuming. For example, LTE is still not available in the UK. In contrast, blockbuster drugs can be distributed most extensively through well-established product distribution channels once national regulatory approvals are given. Judge Posner correctly states that “the cost of producing, as distinct from inventing and obtaining approval for selling, a drug tends to be very low, which means that if copying were permitted, drug companies that had not incurred the cost of invention and testing could undercut the price charged by the inventing company yet make a tidy profit, and so the inventing company would never recover its cost.” However, as also illustrated in Figure 2, the gross profit margins of pharmaceutical and software companies are around the same high levels. This is unsurprising given the ease with which software functions or entire programs can be copied. It makes software companies just as vulnerable to undercutting. Low cost copying and counterfeiting—notably in China—is a major problem with various ICT products. Academic research cited by Professor Hargreaves, and its 2009 re-publication entitled “Sequential innovation, and imitation” by James Bessen and Eric Maskin makes some sweeping statements, including asserting patentees’ unwillingness to collaborate with other innovators, that do not apply in the extensive context of ICT standards that include SEPs. The authors appear oblivious and make no mention of these in their articles. The authors claim that “patents may actually reduce welfare: by blocking innovation”. They assert that “licensing may fail” and so complementary technologies will not be shared among innovators. They lend feeble support to their notion that companies will not collaborate or share by citing a distant example in the oil industry where only 12 out of 3,000 oil fields were completely covered by joint production agreements despite economic and regulatory incentives. Yet it is precisely those industry sectors and R&D activities under criticism by Professor Hargreaves where ICT SEP patentees provide open and non-discriminatory access to their technologies for other innovators and product manufacturers. Standards setting organisations (SSOs), patent disclosures and conformance testing arrangements enable all-comers to implement technologies most easily. Agreements to license to all on (Fair) Reasonable and Non-Discriminatory terms invariably prevail, despite some well-publicised disputes. In some cases, licensing (e.g., Bluetooth) is overwhelmingly royalty-free through a patent pool. In mobile communications technologies licensing costs are predominantly eliminated through cross-licensing. For example, while 40% market share leader, Nokia stated that “until 2007 it has paid less than 3 percent aggregate license fees on WCDMA handset sales under all its patent license agreements”. While concluding that patent holders cannot make enough in licensing fees to make up for a loss of market share in downstream markets, Bessen and Maskin concede in a footnote that their findings “might change if the firms developed complementary innovations that could be advantageously be cross-licensed.” This is exactly what occurs with SEPs, but they make no further comments. Licensing SEPs fosters downstream market development and competition, and upstream collaboration by sharing and building upon the fruits of innovation. Video and cellular standards, for example, have been phenomenally successful with billions of users and flourishing supply sectors. Thousands of patents have been declared to ETSI as likely to be essential to 3GPP standards including GSM, UMTS and LTE. Hundreds of companies collaborate in development of these standards. Most develop or manufacture products that implement the standards in downstream markets. Some of these specialise in upstream technology development but do not themselves implement their new technologies in products. They also deserve compensation for their innovation efforts. The thriving mobile phone sector with reducing prices, increasing choice and blossoming smartphone functionality has been described in several of my previous IP Finance postings, including this one from July 2011. This article also rebuts the discredited Swanson and Baumol ex-ante IP auctioning proposal that Judge Posner cites in his Opinion and Order. By timing SEP auctions after upstream innovators have sunk their enabling technology development costs, but before downstream companies have sunk their product development costs, it would in theory be possible to drive IP prices below upstream innovation costs on a one-off basis. However, in a dynamic marketplace, such loss-making R&D would soon dry up to the detriment of everybody. In addition (to numerous problems with that particular method of fixing prices) evidence presented in my article shows that consumers are doing rather well amid the efficient status quo in licensing SEPs. With standards of great complexity and involving hundreds or thousands of patents in mobile communications each covering different portions of each standard, it would be very cumbersome to administer IP auctions and there would be all manner of undesirable consequences. Whereas standards-based technologies are selected in a collective process on the basis of technical merit by a wide assortment of companies who generally negotiate licensing terms on a separate bilateral basis, auctions create a high risk of collusion among purchasers and would likely unduly emphasise price over other important factors (such as functionality, features, performance, and even total system cost and price to consumers). The means of innovation has changed significantly over the last 30 years with a revolution in ICT industries. The rise of personal computing, the Internet, mobile communications, globalisation and the demise of national monopolies in telecommunications has increased upstream specialisation in R&D, increased collective efforts in standards-based innovation and increased competition among technologies, standards and companies. Some ICT developments tasks are so extensive and economies of scale in production and distribution are so great that collaboration with voluntary sharing of intellectual property on a widespread basis through licensing has proven indispensible. The patent system has underpinned change and growth as ICT’s global economic share has increased with the advance of personal computing, media and communications including extensive software functionality and technical standardisation. The patent system is not perfect, but it is not broken and certainly does not require the radical change proposed by Posner and Hargreaves. There are some bad actors by both infringers as well as patentees, as I have also discussed in another of my IP Finance articles, but courts can and do redress imbalances under the existing law. There is no justification to exclude or discriminate against software and other industry sectors, methods of patent licensing or business models. The consequences of any such exclusions or discriminatory changes to the patent system run the high risk of stifling the very innovation that these sectors generate.